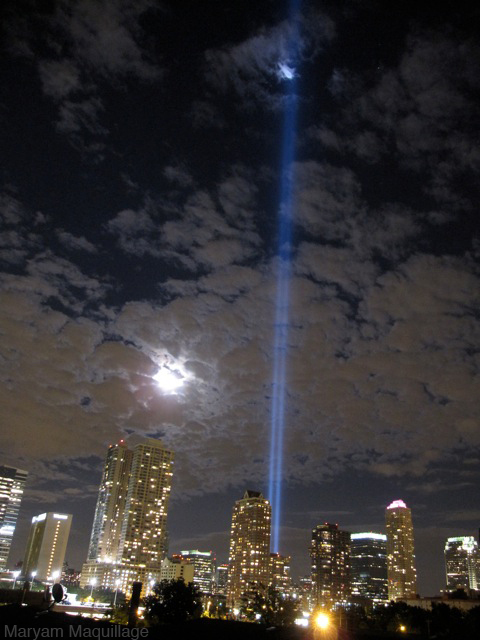 Commemorative 9/11 beams as seen from Jersey City. Where were you 10 years ago today? I was in my highschool library on the computers when the first plane hit and reading about the speculations that it was either a horrible accident or a terrorist attack. Then the librarian brought out a T.V. and we were watching a live feed of the news when the second plane hit. It was beyond surreal seeing it all happen like that. I was living in Boston at the time where the planes took off from, if I remember correctly. So many parents and relatives of fellow students were on those planes, or at the airport, or already in NYC for business. It was such a strange, tense, sad day. Getting sent home early to see my mother with all our neighbours in our living room, with the news on 24/7 making frantic phone calls to husbands working in NYC that day. I was in my Biology class when all of a sudden another teacher came in to speak to ours. There were some hushed voices, and then they said, "All right, everyone to the library." They ushered all of us to the library, all of the students in the entire school, and with every TV available they turned to the news channels. They said, "Watch what has happened. This is history before your very eyes." We sat in silence, stunned, watching what was going on. Some younger students tried to make some jokes, but they clearly didn't understand the severity of what just occurred. I will never forget where I was or how I felt seeing the footage of planes crashing into our buildings, and the destruction it brought. But I also never felt more patriotic in my life, either. I felt my heart swell with pride as I realized that the United States is MY country, and we had been attacked ruthlessly. I remember thinking, "We are strong and we will overcome this." I was in 5th grade and I was in school when I learned about what was happening. Out teacher had the radio on and we were all listening to all the things that were going on. I was young and I didn't quite understand what was going on. I will never forget that day. It was a silent day. Ten years ago, I was at work. Our windows faced south overlooking the most beautiful view of the financial district skyline. The tragedy happened right before our eyes. People were weeping and wailing the moment the Towers collapsed..